Annealing is a process where heat is applied to a material to increase its malleability and make it more workable. Or simply put, a metal is typically heated to a specified temperature and cooled, which results in a softened material that is more easily formed. Induction is one heating method that is commonly used for annealing. A company that manufactures venting solutions was looking to update their induction equipment, and they reached out to THE LAB at Ambrell to assess their process and take advantage of complimentary applications testing. The process involved heating a weld seam for an annealing application. The client had stainless steel and galvanized steel tubes for this application. In this application video from THE LAB at Ambrell, a steel tool is heated to 1400 °F (760 °C) for an annealing application. 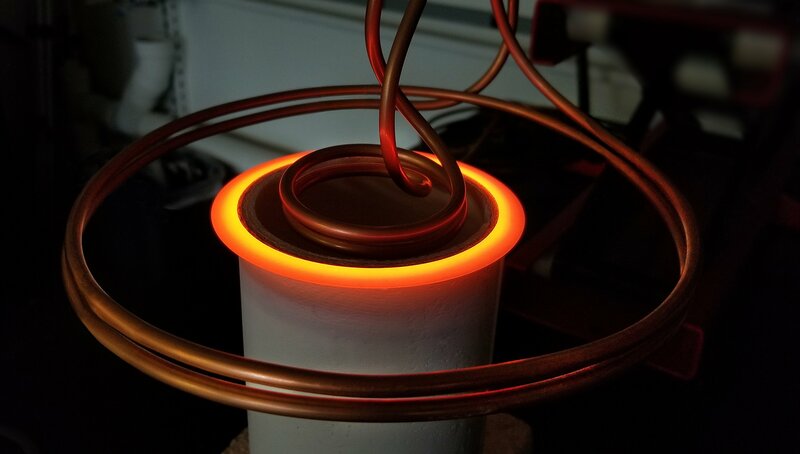 An Ambrell EKOHEAT® induction heating power supply is used. The red sight on the part is from a pyrometer, the temperature displays on the controller to the left, and there is temperature indicating paint down the part. Check out our latest induction heating application video. It involves annealing the tip of a steel part with an Ambrell EASYHEATTM. As you can see in the video, heating took just three seconds.